TIDNISH, N.S. — Well that drive wasn’t any fun at all. We left late, because Trevor, as president of his Venturer company, had to stick around for one last meeting before they get their act together for Adventure 14 in Newfoundland next week. It’s a ten-hour drive to the edge of Nova Scotia, and we had to do it in one shot because of a cabin rental in Tidnish. I haven’t driven through the night on purpose for at least a decade, but I figured if I took a nap, I’d be up for it. And to be fair, things were pretty good for the first four hours. We passed Quebec City around one a.m. and half an hour later I started thinking about fueling up. 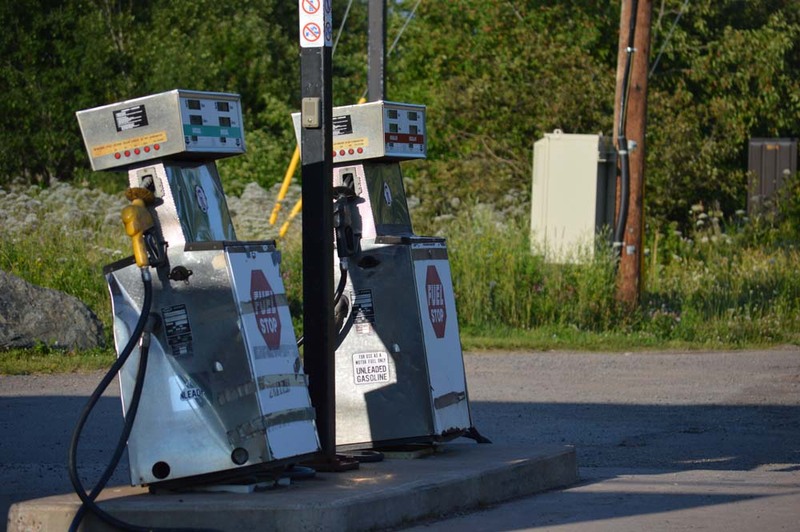 We had an Esso gas card, so when we stopped at Timmies across the road from a brightly lit gas station, we determined that the nearest Esso was in La Pocatière, only 20 minutes up the road. My gas light had just come on and Joe the Truck is ridiculously fuel efficient, so I wasn’t in the least bit worried. Even when we got to La Pocatière and the gas station was closed, I wasn’t worried. We were on the T-Can after all, and there’s always a service centre just around the bend. Unless you’re in far eastern Quebec, I guess. The arm on my fuel indicator dropped from almost empty, to empty, to below empty. I brought the car down to 70 km/h, used cruise control and flipped my blinkers on when I saw trucks in the rearview, so my slowness wouldn’t surprise them. Then finally—a sign! We got off at Saint-Pacôme and eagerly drove to the promised station. It was three a.m. The pumps were set to open at 5:30. “We could just wait here,” I said mournfully. “Sleep a couple hours?” We decided to wing it. We have a lot of faith in Joe. Somehow in the night the towns got father apart, and farther from the road. 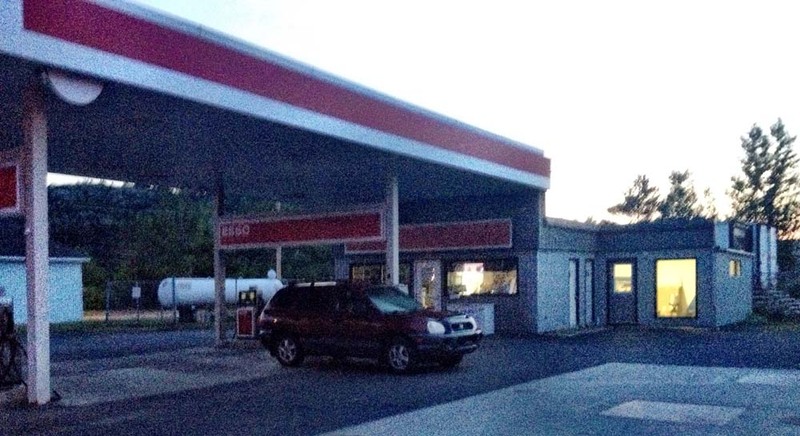 When we finally arrived at an Esso in Saint-Pascal, I decided we’d stay till it opened. We had driven more than 40 kilometres with the gas light on. We slept a little, and watched the moon, looking like a chewed-off fingernail, rise. She knew better than to answer that. There was no right answer. We’d been in the car for eight hours. We were about seven hours from our destination. “Car probably won’t even start,” I grumbled as I turned the key and Joe loyally rumbled to life. We were off again. The last stop was Saint-Alexandre-de-Kamouraska, more than 20 kilometres away. The fuel arm was as low as it could possibly go, lower than I’d ever seen it. Low enough it’d need therapy to recover. I parked at the pump and pulled the key out. It was just after six. An hour later, a slightly surly twenty-something filled my tank and sent us on our way. If you think I’d learned my lesson and it wouldn’t happen again during the next seven hours on the road … well, you’d be awfully wrong. It’s happened twice since, but I think I’m getting the hang of this Maritime thing, where they think you’re smart enough to keep your tank relatively full, especially if you call yourself an experienced roadtripper. I guess there should be a moral to this story. And that’ll be, umn … let’s see. The moral is: drive a Santa Fe. Those suckers will get you at least 60 kilometres on an empty tank of gas. A gripping tale well told..you ‘re a good writer, not something I say lightly! Thank you, Prue. I’m just tellin’ stories.